Mullah Abdul Ghani Baradar has been captured. The Taliban’s top military commander was captured several days ago in Karachi, Pakistan, in a secret joint operation by Pakistani and American intelligence forces, according to American government officials. American officials believe that besides running the Taliban’s military operations, Mullah Baradar runs the group’s leadership council, often called the Quetta Shura because its leaders for years have been thought to be hiding near Quetta, the capital of Baluchistan Province in Pakistan. One of the more intriguing elements of this report is where he has been detained: Karachi. I can be counted among that group who believes that the Quetta Shura is based in Quetta. But the theory has been floated for a while now that Mullah Omar was in Karachi, and now his second in command has been detained there. This follows on soon after logistics attacks occurred in Karachi, not too long after attacks directly against Christians, shootouts between the Taliban and Pakistani police, and about a year and a half after I noted the Talibanization of Karachi. This is yet another data point arguing for the importance of focus on Karachi, the port city through which the vast majority of logistics flows to Afghanistan. The other interesting thing about this detainment is that it is of a Taliban leader in Pakistan, not a Tehrik-i-Taliban, or Pak-Taliban. This is actually a good sign from Pakistan. There is more logistical trouble with the supply lines through Pakistan (lines which supply approximately 85% – 90% of our needs in Afghanistan). The first report has to do with a bridge near Peshawar. Suspected terrorists on Thursday blew up a bridge on a link road connecting Peshawar’s Badbher village to Khyber Agency’s Bara town, officials and locals said. A police official said the blast took place at around 1:30am. The bridge over the Frontier Road was blown up as police personnel travelled through the area, the official said, adding that the terrorists escaped the scene. He said that a search was being conducted to trace the perpetrators of the blast. The second report pertains to a tanker attack near Peshawar. Taliban blew up a tanker carrying oil supply to NATO forces in Afghanistan on the ring road in the Chamkani police precincts early on Monday, police said. Chamkani police officials told Daily Times that an Afghanistan-bound tanker carrying oil supply for NATO forces was attacked by armed men on Monday morning. They said the assailants fired at the tanker and destroyed it with a magnet bomb. The third report is even more important for where it occurred – the port city of Karachi. A NATO convoy came under assault Thursday while carrying supplies through Pakistan to Afghanistan in a rare ambush inside Karachi, the relatively secure port city from which 300 to 400 of the coalition’s trucks leave each day. Any assault on the Pakistani supply route is worrisome to the US-led forces in Afghanistan, who use it to ship three-quarters of their materials and will need it even more as the surge of 30,000 US troops progresses. But the attack in Karachi – which is the commercial capital of Pakistan, and has largely escaped the bomb attacks troubling other major cities and the northwest – raises particular concern, especially if it marks the beginning of a trend. From the beginning to end of the supply lines, logistics is under attack. It still isn’t too late to do the right thing, and engage the Caucasus. We have discussed the Talibanization of Karachi, and while the alleged number of Taliban in Karachi (400,000) is probably exaggerated, there is no doubt that extremism has taken root in Karachi. It was the launch point for the Mumbai attacks, and as we have also discussed before, the port city through which all NATO supplies into Afghanistan through Pakistan flow. Recently the police and Taliban fighters had a shootout in Karachi in which numerous police casualties occurred. Pakistani police have arrested more than a dozen Islamist militants in the southern city of Karachi after a gun battle following a pre-dawn raid on their hideout, officials said. Two policemen were killed and nine wounded before the militants’ resistance was broken after several hours of shooting. The raid came as tension is running high between Pakistan and India in the wake of a militant attack on the Indian city of Mumbai in November, and there is pressure from the international community for Pakistan to crack down harder on jihadi groups. “We were getting reports for a long time that some jihadi elements were active in this area. Today, we raided the area and arrested many of them,” Ahmed said. One Pakistani official also said (coincidentally before this shootout) that “The Taliban won’t cause real trouble in Karachi because it’s their funding point – they get their infrastructure here, the money, the SIM chips, the mobile phones.” Perhaps this official should re-evaluate his position on whether the Taliban wish to cause “real” trouble. Funding point or not, the Taliban will be able to focus their activities on the implementation of Islamic writ and anti-American activities – including the closing of the port city to NATO supplies – with enough fighters. Finally, it isn’t clear whether the police believe their propaganda or not, but one thing is certain. In arresting approximately a dozen Taliban, the Karachi police haven’t yet seen the tip of the iceberg, much less arrested many of the Taliban. Glenn Reynolds links the Small Wars Journal on a potential surge in Afghanistan, and Michael Yon weighed in saying that in his opinion the proposed 25-40K troops won’t be enough. Then Glenn asks a salient and insightful question: How many troops can we support, logistically, in Afghanistan? Glenn has been carefully examining the reports. The Captain’s Journal has a right to weigh in on this subject because first of all, we have been advocating a surge for Afghanistan for at least one year, manned partly by an expeditious withdrawal of Marines from the Anbar Province as recommended by Commandant Conway (we are, after all, a Marine blog). Second, we make very few forecasts, but when we do, we have good track record of accuracy. When Army intelligence was claiming that there wouldn’t be a spring offensive in Afghanistan, we said that there would be a two-front Taliban offensive, one by the Tehrik-i-Taliban in Pakistan and the other in Afghanistan by the followers of Mullah Omar. We also described the strategy of interdiction of NATO supplies into Afghanistan many months before it began to occur. Afghanistan is land-locked, and transportation of supplies and ordnance to U.S. and NATO troops occurs basically in three ways. Ten percent comes into Afghanistan via air supply. The other ninety percent comes in through the port city of Karachi, of which the vast majority goes to the Torkham Crossing (and then to Kabul) via the Khyber pass, with some minor portion going to Kandahar through Chaman. This interdiction of supply routes by the Taliban is an integral part of their offensive. 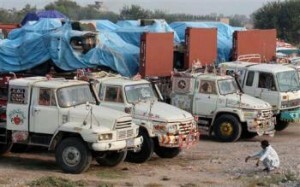 The Taliban have been successful in stopping and confiscating some of the supplies, and Pakistan officials have temporarily stopped transit of sealed containers through Khyber. So returning to the question of logistical support of U.S. troops, there has been an impact from insecurity thus far, and assuming a closing of the transit routes by Taliban fighters, no logistics would be sustainable. But ironically, an increase in force projection in Afghanistan will bring its own logistical rewards and unintended [good] consequences. We tend to see the struggle through Western eyes, and where we see territorial borders, the Taliban and al Qaeda see nothing. It is we who see the phantom, not the Taliban. The enemy is a transnational insurgency and knows no borders, and operations against them in Afghanistan will cause pressure in Pakistan as well. Fighters from Pakistan have been sent to assist fighters in Afghanistan on a regular basis, and Baitullah Mehsud has made it one of his duties to support the anti-government efforts in Afghanistan. Logistics and the degree to which supply routes remain operational will be a function of pressure on the Taliban, and the coupling of these two variables is inversely related. 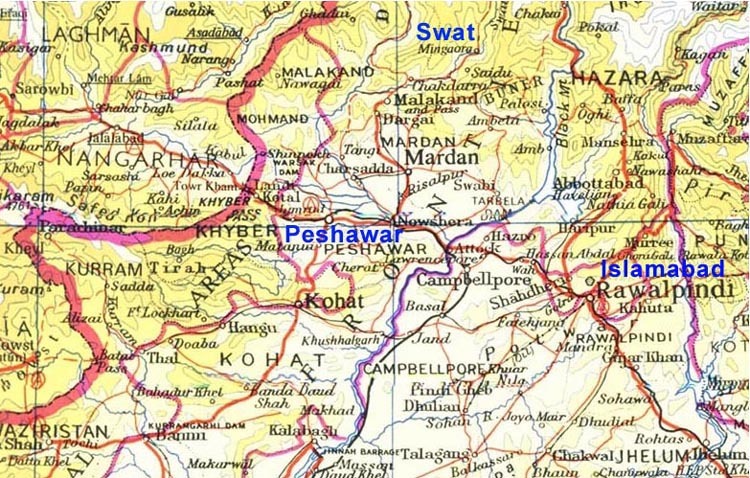 While analysis at The Captain’s Journal relies mainly upon open source information from jihadist web sites, Pakistani, Afghan and other news sources, 95% of which can be Taliban propaganda on any given day, we were right on the danger in Khyber based on these sources, as well as the fact that there would be a two-front spring offensive. The trick is to know when it’s propaganda and when it’s not. The U.S. should continue to work on alternative means of supply, as well as pressure the Pakistan Army to continue operations against the Tehrik-i-Taliban in Khyber and in and around Peshawar. But the surest way to put pressure on the Taliban is to conduct kinetic operations against them in Afghanistan. Pressure on the Taliban anywhere will redound to open supply routes. UPDATE: Welcome to Instapundit readers, and thanks to Glenn for the interest. Seven months ago The Captain’s Journal published Taliban and al Qaeda Strategy in Pakistan and Afghanistan in which we outlined a major prong of the coming strategy to cut off supplies to NATO forces through Pakistan. We followed this up with a discussion of the importance of the Khyber Pass and the Torkham Crossing, the Northern border crossing through which supplies flow, and which has been the target of attacks against fuel tankers and other traffic. We’ve also discussed the Talibanization of Karachi, Karachi being the only port through which supplies flow. Thousands of Taliban fighters have entered Karachi in a sign of the increased enemy interest in controlling this vital hub of transit. From Karachi the supplies go to the Southwestern Pakistan city of Chaman to cross into Afghanistan or to the Northwestern province of Khyber and then to the Torkham Crossing, eventually arriving in Kabul unless interdicted by the Taliban. The Taliban have worked to close both of these supply routes. 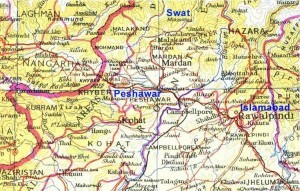 But recently they have moved their targeting South of the the city of Peshawar and the Khyber Pass. In other words, they are expanding – not moving – their points of interdiction. They are now targeting the supplies as they come North from Karachi to Kohat. The Pakistani army is locked in a fierce battle to stop fuel and arms supply routes to British and American forces in Afghanistan falling under Taliban control. Last week Pakistani troops launched a series of raids on villages around Peshawar, capital of the North West Frontier Province, in pursuit of a Taliban commander blamed for bomb attacks that have destroyed more than 40 fuel tankers supplying Nato troops in Afghanistan. They claim that Mohammad Tariq Alfridi, the commander, has seized terrain around the mile-long Kohat tunnel, south of Peshawar, three times since January. He has coordinated suicide bomb attacks and rocket strikes against convoys emerging from it. The Taliban attacks stretch all the way south from the Afghan border to Karachi, where weapons, ammunition, food and oil supplies arrive at the docks before being transported by road. Last week western diplomats in Karachi said there had been an alarming increase in Taliban activity in the city. 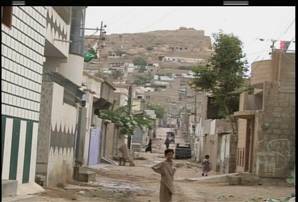 Local politicians said they had been warned by intelligence officials that 60 Taliban families had fled to Karachi from tribal areas close to the Afghan border and had begun to impose strict Islamic law. They had recently posted notices throughout the city forbidding girls from going to school. The army’s antiTaliban offensive in the tribal areas appears to be hitting the militants hard. Last week Maulvi Omar, a Taliban spokesman, said that his fighters would lay down their arms if the army ceased fire. His offer was ignored. The battle for the tunnel began at the start of the year when Taliban fighters seized five trucks carrying weapons and ammunition. They held the tunnel for a week before they were driven out in fierce fighting. Since then Tariq and his men have returned several times to attack convoys. The army launched its latest onslaught after a suicide bomb attack at one of its bases near the tunnel six weeks ago. Five people were killed and 45 were injured, including 35 soldiers, when a pickup truck packed with explosives was driven into a checkpoint. When The Sunday Times visited the approaches to the tunnel last week, several bridges along the road bore the signs of explosive damage and bullet holes. Villagers said the Taliban had not fled but had melted into the background to wait out the army assault. Pakistan is not just strategically important for U.S. interests in Afghanistan. Pakistan is quite literally in a fight for its continued existence. The Pakistan army’s juvenile preoccupation with expansion and war with India will become deadly if not relinquished in favor of a realistic view towards self preservation from internal threats. Intensive negotiations (and eventually, pressure) must be brought to bear to secure the supply lines into Afghanistan, and eventually to obtain permissions for U.S. operations. Currently, 90% of NATO supplies enter through Karachi, while a total of 80% go to Torkham through Khyber, with the remaining 10% going to Chaman and finally to Kandahar. Only 10% come into Afghanistan via air routes. The 10% that comes in via air supply is about to become very important, and unless Pakistan can secure the supply routes, the amount coming into Afghanistan via air supply must increase (e.g., through India over Pakistani Kashmir or other routes). The Captain’s Journal has discussed the influx of Taliban to Karachi before, as well as the fact that it is an important port city through which NATO supplies flow (ultimately through two passes, one at the Torkham Crossing and the other through the Southwestern city of Chaman). But the supplies mainly come into Pakistan through the port of Karachi. There are reports of a massive influx of Taliban into Karachi and the surrounding provinces. Muttahida Qaumi Movement (MQM) chief Altaf Hussain has said that more than 400,000 Afghans and foreigners equipped with weapons have entered the city and alleged that these terrorists wanted to occupy Karachi and Hyderabad and the entire Sindh. In a statement issued from London on Sunday, he warned that they did not want to fight anyone but added that if the MQM areas were attacked they would defend themselves in accordance with the UN Charter and Islamic Shariat. He said that the MQM wanted to make Pakistan a liberal and democratic state and not a country governed by al-Qaeda, Taliban or religious extremists. This report is probably exaggerated (the total is probably << 400,000), but a much better anecdotal account of the Talibanization of Karachi comes from Richard Engel of NBC News along with his interpreter. Many Pakistanis attend madrassas because they offer free education, supplementing the government’s lacking public school system. For centuries madrassas were the only form of education in the Islamic world. From Morocco to Indonesia, most madrassas have a similar layout, with a mosque at the center and classrooms upstairs. The vast majority of madrassas are moderate charities that teach religious values, the Koran and the traditions of the Prophet Mohammed. Former President Pervez Musharraf promised to reform and regulate Pakistan’s hard-line madrassas. It never happened. According to Karachi’s former mayor Farooq Sattar, there are now more than 2,000 illegal madrassas in Karachi alone. This was one of them. “What do you think of the Taliban and their influence here?” I asked the students. “God willing, we will fight them,” said one teenager with a purple scar on his chin. “They are the enemy,” he said and launched into a long explanation of America’s goal to occupy Muslim lands and undermine Islam. I’ve heard the same speech from Cairo to Lebanon, Baghdad to Riyadh. God bless the Internet. A few minutes later my driver/fixer, a very tough guy from a very tough part of Pakistan, tapped me on the shoulder. “I think you have been here long enough,” he said. It was time to go. But I still hadn’t seen any Taliban. Malik suggested we go deeper into the slum, to the neighborhood right under the cliffs and quarries. He was nervous about taking a foreigner, but had an idea. There was a graveyard in the area. Malik said praying at a gravesite would give us an excuse to be in the area and raise less suspicion. It didn’t exactly work. As soon as I stepped out of the jeep by the gravestones, I was again surrounded by a group of people. They didn’t have weapons or appear threatening, but didn’t attempt to hide their sympathies for the Taliban. One man proudly told me several suicide bombers had prayed in a nearby mosque. But others were scared of the Taliban. A man who spoke English told me the Taliban were in control of the area. More men, athletically built in their 20s and 30s, started to arrive. “Who are these people?” I asked the English speaker. The new arrivals didn’t want to be interviewed. “Stop asking them questions,” the English speaker advised. Both of these reports point to the same thing, even if in different ways. The campaign is in deep trouble when the main route for supplies, ordnance and fuel is in trouble. If the Taliban have their way, Karachi will not be hospitable for very much longer. Causing a diminution of Taliban capabilities and turning the tide of the campaign is very important, and it’s important to do so in a timely manner.